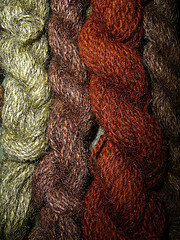 Multipurpose rhubarb-dye can color your wool, and makes a great easter-egg-dye as well.Better for you and the environment, dye made from rhubarb can be made and used in a variety of ways. There are so many vegetable and fruit based products available these days to dye different things in a natural and organic way. This dye will produce a lovely shade of various red or orange colored tones. Depending on how long they are left, the effect can also result in a light shade of pink. 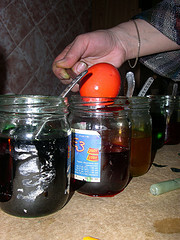 Rhubarb-dye can be used for coloring easter eggs. If you have rhubarb stalks or even a rhubarb root, they can be cut into pieces, simmered until the color is extracted and the eggs can then be dipped for however long suits you. Boil your cut up stalks with a few cups of water to form a compote. Strain the mixture, and add the eggs when cooled. Let them absorb the color until it seems just right, and remove the eggs to let dry. Remember some steps before you start. Lay some newspaper down to protect the surface. Boil eggs for 8 minutes and then let simmer. This is a great video courtesy of Chris at YouTube, that shows how other vegetables can be used in addition to rhubarb-dye. In this video, he has chosen to use cabbage. There are also simple little tricks shown on how to make some of those neat designs you see on eggs done by other people. Yes, you can do it too. Take a look at the video. A recipe for a piece of rhubarb root and 4 cups of water can produce a dye for people who are light-haired can use. This will create overall lighter tones throughout the hair. The mixture is simmered in a teflon pot for at least an hour and then strained. After it has cooled, the liquid is used as a rince over and over again after a shampoo. They say the effects are quite nice, and permanent too. As in any dye to do with hair, a strand test is advised first. I can't stress enough to be careful with this. Though it seems there are those people who use this technique, fooling around with hair makes me nervous, but that's just me I guess. I am not fair-haired at all, so this won't tempt me. I've had a few at-home near disasters in my time with regular products, so I am quite happy to visit the hairdresser. Then again, I think back to when I was a teenager, and we used to be obsessed with combing our hair with strong tea before we went out to lay in the sun all day. We didn't hesitate for a minute, and as I remember, the effects were nice... on us brunettes anyway. Please remember this about the rhubarb roots. Rhubarb-dye can also produce a very orangy color too depending upon the species of the root used. Keep that in mind when it comes to your hair. Wool that has been pre-mordanted can also be dyed with rhubarb. Mordants are metallics or mineral salts that when combined with natural dye, will act to intensify or brighten a color, or even change the color. A little washing soda can be added also to produce a coral or dark red color if that is your preference. The rhubarb roots are simmered for one or two hours, and the wool is added to the pot. The mixture is slightly reheated, and then turned off. Again, depending on the shade you are looking for, the item would be left to soak in the dye mixture for however amount of time it takes to soak up the dye. The item is removed from the pot, rinced thoroughly in clean water and left to dry.